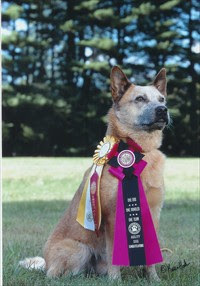 Koala Redhot Jumpin Jackaroo (aka Jack) is our 3rd dog and first Australian Cattle Dog. He was a rambunctious, go getter from the first day he came to live with us when he was 10 weeks old. Can you see the devil in that cute pup? Oh yeah! When Jack first came to live with us he was a bit out of control to say the least. 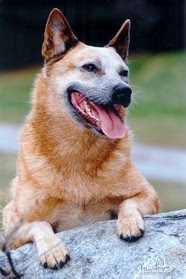 Australian Cattle Dogs are truly a breed apart. They are independent, smart, hard working and very busy. They most definitely need a job. They are also very willing to work with their owners, are extremely loyal and fiercely focused. All of those attributes are what I love about the breed and I am not sure I will ever want a different breed. I wanted a pure bred dog so I could compete in AKC events and had great ambition to take the Obedience and Agility venues by storm. Jack is very intelligent and learned everything with amazing swiftness. He sailed through puppy class and Level 1 and 2 Obedience with ease, so I really thought we would have a wonderful career. However, at about 4 months old Jack started showing signs of aggression toward other dogs. I did all the wrong things hoping to stop it and to keep him safe, but of course I ended up making things worse. I got a bit of good advice and some really bad advice. Through much learning, consulting dog trainers and behaviorists I have learned a fair amount about dog to dog aggression and have been successful in reconditioning Jack in most situations. We have had some nice successes in the agility ring but our obedience career came to an abrupt halt after our debut when Jack tried to eat a Bouvier des Flandres and a Golden Retriever while waiting in line. This behavior is frowned on by AKC judges and I have agree it was really not what I was working toward either. I was so disappointed, his heeling is just spectacular and his recall, well there are hardly any I have seen as nicely performed. But it’s just not his placed to shine. Agility is his first love. When we compete in agility Jack is amazing, he is so incredibly focused and fast! If he had a faster, younger, more athletic handler I’m sure he would be further along, but he has me and he loves me anyway. He is stressed while competing and sometimes he won’t take obstacles ahead of us because he is worried I might be too far away from him. This has kept our qualifying rate much lower than I like but we are who we are. We continue to forge ahead and now are competing in AKC in Excellent Standard and Excellent Jumpers with Weaves and USDAA (United States Dog Agility Association) at the Master level. Pretty good stuff for a dog who really is very stressed competing in public and who has aggressive tendencies. I am pretty competitive, (ok very competitive) so I really have to remind myself what a miracle it is to be able to compete with him at all. My experiences with Jack have also been useful to my career a s I have been able to teach others my techniques and help them manage their difficult dogs. That’s truly a blessing! I believe that’s why God gave him to me and because not too many people would have kept him. All in all I wouldn’t trade my Jackaroo for anything. There have been days when I thought I could happily strangle him, but of course I love him so I’m glad I was able to resist. And just look at that happy smile. What a great dog he has turned out to be. He will turn 8 on January 29th this year and though he has been difficult he has also been one of the best experiences of my life. I simply can’t tell his whole story in this first introduction but we will revisit my boy in the near future. Yes he does love his Uncle Larry!! !